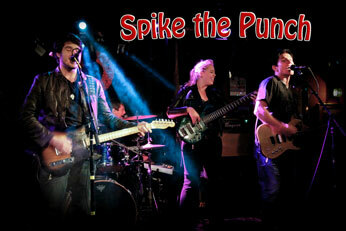 Spike The Punch is a high energy rock band based out of Boston, MA. The band, formed by Jeff Fraser, has been performing cover songs at the Boston area's top night clubs since November 2000 and is rocking the town as strong as ever playing live music from yesterday to today and leaving audiences wanting more. Check out the videos page to watch and listen! If you are getting married, and are searching for a wedding band for hire, you are probably looking for the function version of the band, Men In Black, which can be found by clicking on bride and groom icon. Spike the Punch performs at some of the best clubs in the Faneuil Hall area and plays a lot of local shows on the North Shore as well. The song list is mostly in the rock genre from the 70's 80's 90's and today. Most of the band's live shows take place on Friday nights because Saturdays are reserved for weddings, but in the off wedding months, you'll find a lot of Saturday night shows on the entertainment schedule. Looking at wedding bands? You've come to the right place! The members of Spike the Punch also belong to the popular Boston wedding band Men In Black. MIB has perfomed at thousands of wedding receptions and has recieved great reviews from Brides and Grooms all over Massachusetts and New England. Check out the Men In Black web site and see for yourself! Not your typical G.B. band! If you are a fan of live bands and want to dance, sing along, or if you are just looking for a good time out on the town, check the calendar page to find out when and where the next local Spike the Punch show is! Check out Spike the punch on these sites!